Abraham Maslow was an psychologist who came up with the hierarchy of needs, which is a theory on what motivates people to achieve and grow. 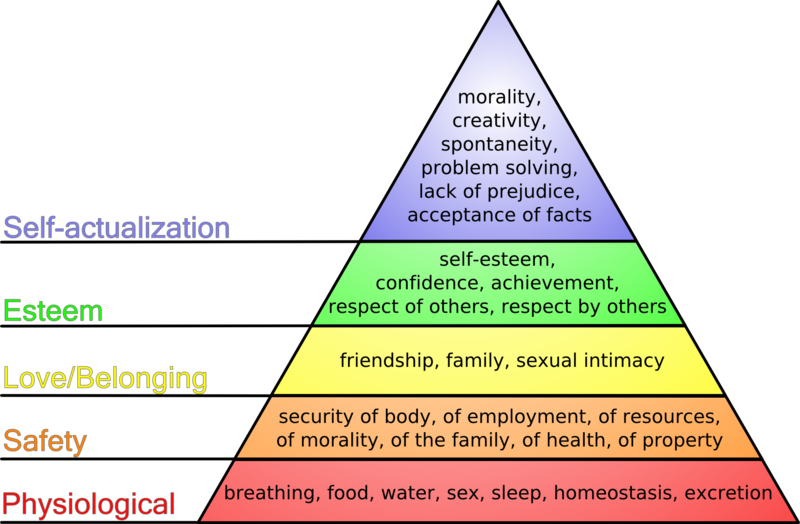 Above is a pyramid that interprets Maslow’s hierarchy of needs, the most basic needs of people at the bottom which many are just to survive, going all the way to the top where someone is at their best and doing all they are capabel of. Maslow believed that when one of the levels is fulfilled a person can move onto the next one, however progress through the stages can be halted by many different things, normally problems in people’s life’s that can move them down a level. Personally I don’t think that all levels are needed to be achieved for self-actualization, I’m pretty sure Vincent van Gogh’s work wasn’t appreciated or respected by others (Esteem) and he would not of been able to create the pieces he did if he wasn’t in a state of ‘self-actualization’.